There is, of course, no single system of holding the instrument that works for everyone. Shoulder width, depth, drop-off, as well as arm length and tendon flexibility all play a part in determining how to hold the instrument. May I suggest, though, an alternative that might bring a nice mix of support and customization options. 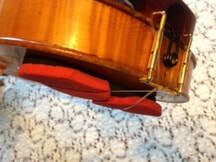 ​This would be using a hard foam shoulder rest, attached by rubber bands. 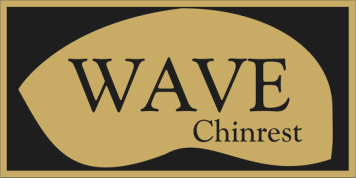 ​A foam rest offers an extremely wide array of design options, allowing the player to radically shape the rest and to place it wherever on the back of the instrument they wish. 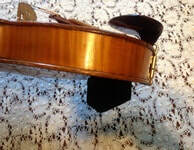 ​Often, a shoulder rest might come close to fitting the player's shoulder, but might miss the mark here and there. The foam rest can be cut to fit the desired profile of the individual player. And here is my own, cut down to about 1/4", with red sponges to cushion the shoulder. ​A hard rubber rest, attached to the back of the instrument, can have a lot of advantages. Remember the contact points on the shoulder, and where they tended to be placed with a rigid rest? The foam rest allows the player to customize those contact points to their preference. it can be placed anywhere on the back of the instrument, and at any angle one wishes, giving support in just the right places. Since it it non-rigid, it does not direct the head weight in a pre-determined pattern, but delivers it to the shoulder in a natural flow. Additionally, and this is important, it does not lock the instrument into one position. When one plays, one shifts the violin around in subtle patterns to match both the musicality of the phrase, as well as its technical requirements. One will hold the instrument in a slightly different position to play on the G-string, as opposed to the E-string position. Further, one will make small adjustments for shifting, tone color, dynamics, etc. Having a malleable surface under the instrument can aid in this feeling of freedom. Yes, foam rests have a reputation for undesirablity. They can give a bad visual presentation, the rubber bands look amateurish, and they absorb the sound. But the well-chosen foam rest can answer those objections. I have found the Belvelin rest to be quite satisfactory. The rigidity does not dampen the instrument; indeed, with its hard rubber construction, it can actually act as a reflecting board, enhancing the sound. Also, currently available clear rubber bands, made to a sufficient length so only one is needed, and made of a strong material, minimizing breakage, give us attachments that are not visible. In the search for the perfect set-up, one must find their own solutions; using another's set-up will rarely yield optimum results. May these be points for further consideration and discussion, and may you have all the best results in finding your own balance with your instrument.